This press photo is for the Mutual Broadcasting Company’s quiz show Three For The Money which was more successful on television than radio. I found this info and more at probably the best old time radio site around The Digital Deli. 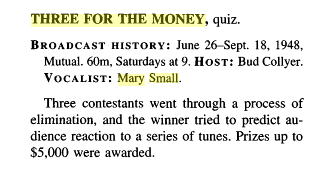 The description for the show below comes from On the Air: The Encyclopedia of Old Time Radio by John Dunning.